Rusty's Saloon is your classic dive bar with pool, suffleboard, darts, and good beer selections. 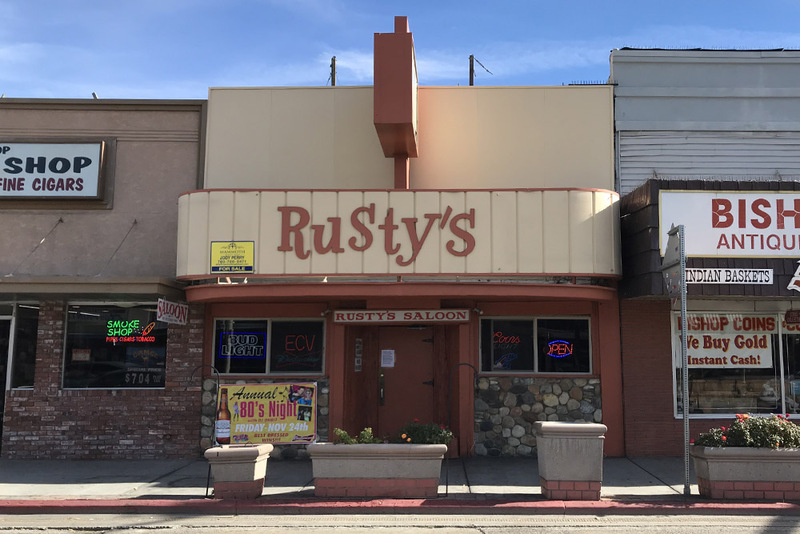 First opened in the 1940s, Rusty’s used to be a classic cowboy and Indian bar, with plenty of brawls and country music, courtesy of the local patrons and plenty of cattle in need of punching at nearby ranches. Those days are over (mostly) and Rusty’s was recently remodeled; there are plenty of pool tables and room to dance in the back. It is a great place to get some local color, meet a special someone or just down some shots. Get your friends together for group shots. The backdoor still spills out onto the Whitney Alley with plenty of room to smoke or make-out. There’s karaoke most Fridays and all the holidays are celebrated not just the drinking ones. They have dart tourneys, live music from bluegrass and singer-songwriters to local DJs and the occasional metal band. The saloon is popular with Clampers. The red-wearing drinkers have an annual dog and pony show at Rusty’s. When Janie’s Ranch, local brothel in nearby Nevada, was still in business, the ladies would dress in their best Wild West floozy outfits and entertain, dance and cheer, the Clampers. Those days are gone but the Clampers remain.